This USB-C™ to HDMI® adapter cable offers a convenient solution for directly connecting your DisplayPort over USB Type-C™ device to your HDMI monitor, television, or projector. 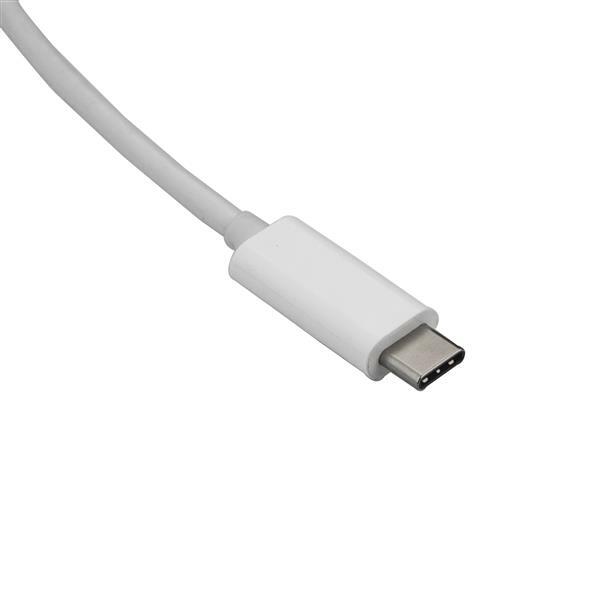 The adapter offers a connection distance of up to 3 m (10 ft.) and works with USB-C devices that support DP Alt Mode, such as the MacBook, Chromebook Pixel™ and Dell™ XPS™ models 15 and 13. It's also compatible with Thunderbolt™ 3 ports. While this white adapter looks great next to computers that match the look and feel of laptops like your MacBook or HP® Envy, it works with any USB-C computer that supports HDMI. At 3 m (10 ft.) in length, this adapter cable delivers a direct connection that eliminates excess adapters and cabling, ensuring a tidy and professional installation. For shorter installations, StarTech.com also offers a 1 m (3 ft.) USB-C to HDMI cable (CDP2HD1MWNL) and 2 m (6 ft.) USB-C to HDMI cable (CDP2HD2MWNL), enabling you to choose the right cable length for your custom installation needs. 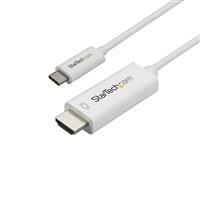 The CDP2HD3MWNL is backed by a 3-year StarTech.com warranty and free lifetime technical support.